By popular user demand Bat Kid returns this time in Applique. Piece together super hero cuteness with this adorable high action design. Stitches wont know what hit em' when Bat Kid makes his way to your machine! Download this awesome free for today today only! Also, Be sure to get our hilarious These Fools Put My Cape On Backwards Design for your Gold Member only Daily Freebie. Our new Gold Membership plan offers a way to give you access to all our expired designs as well as ensures you will never miss a daily design. For the price of only a few patterns you will receive 60 a month plus an archive full of hundreds. Check it out HERE. We have relaunched and redesigned our Facebook page! Get a coupon code for 20% of your entire order at BlastoStitch.com by 'liking' us on Facebook.com/BlastoStitch. Go to the welcome link just under the banner photo. Please take a moment to read our disclaimer. Please help us keep the site Free and Fun by taking a moment to read it here. 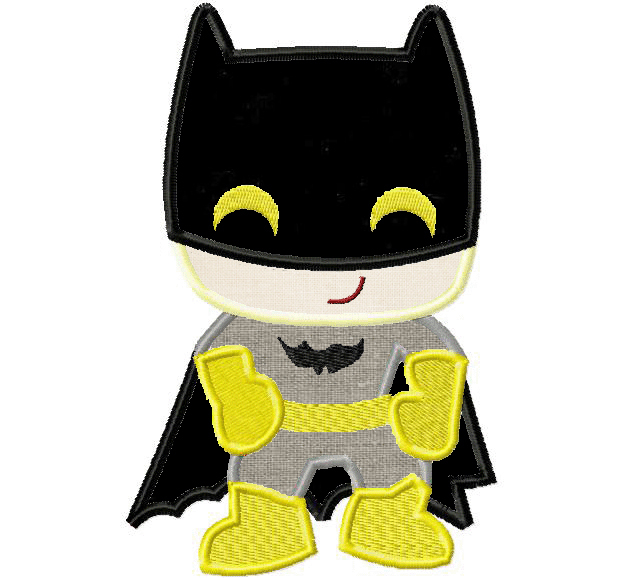 The Bat Kid Applique Designs include a PDF color sheet and all of the following sizes: 3" 3.5" 4" 4.5" 5" 5.5" & 6"
Too cute! Thank you for all the creative designs.